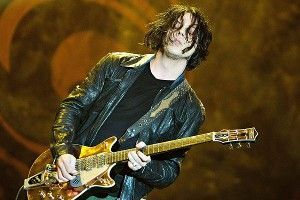 Jack White has never been one to stand still, but his post–White Stripes era has elevated his all-purpose restlessness to bold new heights: There have been appearances on American Pickers, collaborations with Insane Clown Posse, even an actual solo album. And now, his latest endeavor, as reported by Variety: The score for The Lone Ranger, the Jerry Bruckheimer–produced adaptation of the ’50s TV show starring Armie Hammer as the title character and Johnny Depp as his sidekick, Tonto. Thanks to its grotesquely swollen budget, the movie had been declared all but dead this past summer; eventually, reducing the budget to something less grotesquely swollen got it back on track. But these days it’s not only alive and well, it has a buzz-worthy Jack White score to go with it. Says Bruckheimer, “[Director] Gore [Verbinski] hatched the idea and Johnny was thrilled with it. We’re all very excited to have him on board … Jack’s an amazing songwriter with a unique style. We’re thrilled to hear his fresh take on the William Tell Overture.” Let’s hope that all goes well, and that Jack and Jerry’s relationship continues to flourish, and that eventually the apparently-terrified-of-boredom White goes on to play a mutilated corpse on Bruckheimer’s CSI: Miami.